Ever since I was young, I have had a debilitating fear of wasps. Although I am not dangerously allergic, I did get stung quite a bit growing up. This was mostly due to my overwhelming stupidity more than any type of parental neglect. My combination of curiosity and embarrassingly slow reflexes would inevitably lead to me walking inside the house adorned by swollen welts. I always took some solace in the fact that they would die not long after stinging me, or so I thought at the time, I have since realized that many species can continue stinging multiple times. 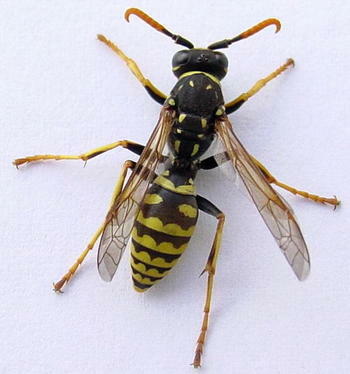 I am driving down the road on a pleasant spring day when a meandering yellow jacket enters my car through the passenger-side window. The brightly colored insect begins a futile attempt to exit the car by flying toward the windshield, which incidentally brings him close to my face. Sensing danger, I release one hand from the wheel and begin to swat at the bug while bobbing my head wildly in order to avoid a retaliatory sting. This only angers the yellow jacket, causing him to dive bomb my head as I continue down the street at 65MPH. I am now gyrating my entire upper body in an attempt to confuse the wasp, which causes me to drift wildly in and out of my lane. After several minutes of this voluntary road-seizure, the bug finds his way out of the window. The fascinating thing about this scenario, other than how entertaining it must be for those traveling behind you, is the fact that I am willing to lose control of a two ton automobile traveling 65 miles per hour in order to avoid a sting from a wasp. I am literally risking higher insurance premiums, bodily harm, and possible death just to avoid a minor welt that I will shameless use to evoke sympathy from my wife later on. Logically, I understand that the greatest threat to my long term survival is remaining in control of my car but when faced with this flying insect the size of Jolly Rancher, I drop my biscuits. And it isn’t just driving. I have almost thrown myself from a ladder while cleaning my gutters just because I thought I heard a faint buzzing sound. 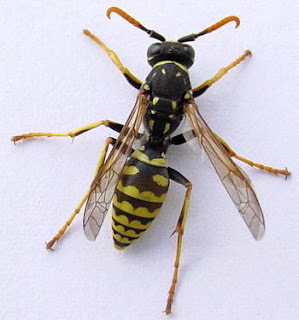 I realize that wasps, like all insects, have an integral role in the food chain and are often used to control other pests, but I will not hesitate to marinate one in RAID Hornet Killer. In fact, if they sold a formula that caused the wasp to spontaneously burst into flames mid-flight I would buy one for each hand, film the results, and then play that video for the relatives of the wasp so that they could spread the word.